You are here: Home / Loans / Credit Card Loans vs. Personal Loans: Which one should you choose? Credit Card Loans vs. Personal Loans: Which one should you choose? Credit cards Loans and Personal loans are both expensive in terms of interest rates, so which one should you go for? 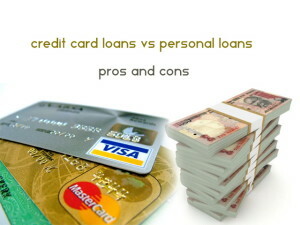 There are few pros and cons you should consider before you opt for either Credit card Loan or Personal Loan. Credit cards provide us with urgent cash when we need it, provided it is within the credit limit. You can pay for your expenses right away and repay the bank at a later date depending on your due dates. However, if you need cash above your monthly credit limit, then your same plastic card can provide you with a loan which you can repay through EMIs. However, there is a close cousin of these loans in the form of personal loans that does the same, in terms of fulfilling your urgent cash needs at similar rate of interests. So which one should you choose and why? Let us consider the factors that can help you make an informed decision in the battle between Credit Card Loans Vs Personal Loans. There is not much to choose from in terms of Rate of Interest (ROI) between credit card loans and personal loans as they are pretty high and in most cases at par. However of the two, Credit Card Loans will attract slightly Higher ROI as compared to personal loans. Also your credit card bills repayment history will factor in the ROI you get in terms of Credit Card Loans. It further depends on the nature of card you have Silver, Gold, Platinum etc. In case of Personal Loans, this ROI will depend on your eligibility and the tenure of loan and can vary anywhere between 13 % to even 32 %. Credit Card loans come pre-approved, depending on the nature of card you have. So if you have been regular with your credit card payments, your eligibility is pre-determined and you can avail that much loan amount. Personal Loans will need you to go through a thorough screening of your nature of employment, credit score, monthly income, tenure of loan etc. and only then will the eligibility be determined. In case of credit card loans, though the eligibility is pre-determined, the amount of loan is limited. It is usually somewhere between 2 lac to 7 lac. It can be increased in some cases. Personal loans can be availed up to a maximum of 15 lac based on your eligibility and other criteria. Credit card loans are pre-approved, and hence require the least amount of processing time. This is because while issuing you a credit card the banks have already done your credit checks and determined your eligibility etc. They do not required additional documentation and the amount can be availed either through DD or even transferred to your bank account directly. Personal loans involve some amount of processing and so can take anywhere from a week to even a month in some cases. The processing fees are charged in both cases however it is nominal in case of credit card loans, while for personal loans it can range from 5,000 to 10,000 INR. Repayment can be done based on monthly installments in both cases. For credit card loans, you will be billed on your credit card, the amount of EMI that you need to pay; you can of course opt for direct debit facility from your bank account. Personal loans have the usual EMI structure that most loans have. Credit card loans will usually not have any pre-payment penalty. Personal Loans usually do have some pre-payment penalty that banks charge. There are banks that do not charge pre-payment penalties, however it is dependent on case to case basis. This is where you have to trade off your credit limit of your credit card. If you have an on-going credit card loan on a particular card, the credit limit that you usually enjoy on that particular card, can be reduced by the bank or even frozen, to avoid you running up a huge credit. This credit limit is slowly increased as you repay some part of your credit card loan. Personal loans will not have any such limitations as it not dependent on your credit card debt. So if you have a personal loan from a bank, you can still use the credit card with the previous credit limit unchanged. However you should be able to manage the dues on your EMI and the credit card bills to keep yourself from falling in the debt trap. Also Read: 8 ways How to use your Credit Card Sensibly? So as we saw, it’s more or less a matter of personal choice and the situation you are in when you need funds. If you need fast immediate, no hassles loans, credit card loans are the ones for you. However, if you can wait for a few days and need slightly lesser interest rate than you can opt for personal loans. The other factor is if you can live with the reduced credit limit on your credit card, then surely you can go for credit card loans. One should also consider that in case the interest rates are too high in both cases, you still have alternate options to personal loans and credit card loans which you can find here, which are quick and at lower interest rates.